I have a friend who is a conspiracy theorist. He told me a few months ago to watch for the “feds” to attempt to bring down a “big bank”. He had various explanations for this – the world order exerting its authority, something to do with the upcoming presidential election, etc. It was, therefore, ironic (maybe even spooky?) when the Wells debacle materialized. No, I am NOT saying this was part of a giant conspiracy. I am just saying it has coincidentally been a bad month for Wells Fargo. Ever since the financial crisis, all big banks have been subjected to scrutiny, enormous fines, criticism, etc. Just Google Jamie Dimon (CEO of Chase) and you will soon see articles such as, “What's Wrong With Jamie Dimon Is What's Wrong With America”. The answer to that question is now – so many, many things. But let’s start with the massive trigger event. According to CNNMoney.com, “The way it worked was that employees moved funds from customers' existing accounts into newly-created ones without their knowledge or consent, regulators say. The CFPB described this practice as "widespread." Customers were being charged for insufficient funds or overdraft fees -- because there wasn't enough money in their original accounts. The CFPB said Wells Fargo will pay "full restitutions to all victims." Regardless, the CFPB also levied a $185 million fine levied against the firm. It seems like Wells just cannot do well lately. When he testified in front of the Senate Banking Committee, he apologized but it wasn’t enough for the senators. “You should resign. You should be criminally investigated by the Department of Justice and Securities and Exchange Commission,” Senator Warren told Stumpf. Other senators pressed him on executive compensation and whether there should be clawbacks. The Wall Street Journal reported, “Wells Fargo CEO Defends Bank Culture, Lays Blame With Bad Employees”. My Stumpf promised to, “… eliminate the practices at the center of the controversy: branch-level sales goals that encouraged employees to cross-sell products to customers … Many of the employees felt pressure to sell customers multiple products or services—for example, home-equity lines to certificate of deposit holders—to stay in their jobs or earn bonuses tied to sales goals, according to interviews with current and former Wells Fargo workers. Some branch employees met with their managers several times a day to report their progress on meeting cross-selling targets, they added.” And the dismissal of the 5300 hundred employees was not in one fell swoop. “The 5,300 employees who were fired over five years due to improper selling, Mr. Stumpf said, included bankers, managers and bosses of those managers. Chief Financial Officer John Shrewsberry said about 10% of the employees let go were branch managers or higher. Much of the activity occurred in Wells Fargo’s large community-banking division. That unit generated $12 billion in revenue in the second quarter and accounted for 57% of the overall bank’s net income during the quarter. On Tuesday, Mr. Shrewsberry said the bank is spending $50 million annually on addressing these issues. “Cross-selling has been a religion there,” said David Hendler, founder and principal of bank research firm Viola Risk Advisors, LLC. “They can’t say we’re not going to do that and not have another idea to roll out in the meantime,” Mr. Hendler said. Wells Fargo has sought to put the 5,300 figure in the context of its overall workforce of nearly 270,000 staff. But Mr. Stumpf acknowledged Tuesday that the number of dismissed employees was far higher than he wanted. A public and political uproar followed the allegations that Wells Fargo employees had opened as many as two million accounts without customers’ knowledge and sometimes created fake email addresses on phantom applications. According to Fortune, here is one huge effect. “Wells Fargo Is No Longer the Most Valuable Bank in the World”. In September, “Fargo shares continued to fall in Wednesday trading, bringing its overall market value down to about $228 billion—more than a $9 billion loss in value. That lifted competitor JPMorgan Chase JPM 0.03% to the top spot with an approximate $10 billion market cap advantage over its rival. Fargo’s stock has plunged 7.75% since last Thursday.” That is one major and adverse ramification. At least one other state followed suit. According to the LA Times, “Illinois, following California, sanctions Wells Fargo over accounts scandal”. And this trend could continue. Business Insider voiced a different opinion. “Digital disruption is partly to blame for the Wells Fargo scandal.” They point to the need for changed tactics necessary to accommodate millennials. “It makes sense that Wells Fargo is pushing its employees to enroll customers in as many services as possible, because more services mean more loyalty, less attrition, and higher lifetime value. For example, mobile banking users, who are among banks’ most engaged clients, consume one more product and have lower attrition rates than branch-only customers. But the retail banking industry is extremely competitive right now, thanks to the proliferation of fintechs and other alternative service options, which means growth is challenging and makes extracting value from existing employees increasingly important, according to CNN Money. More millennials are moving toward digital banking, and as a result, they're walking into their banks' traditional brick-and-mortar branches less often than ever before. 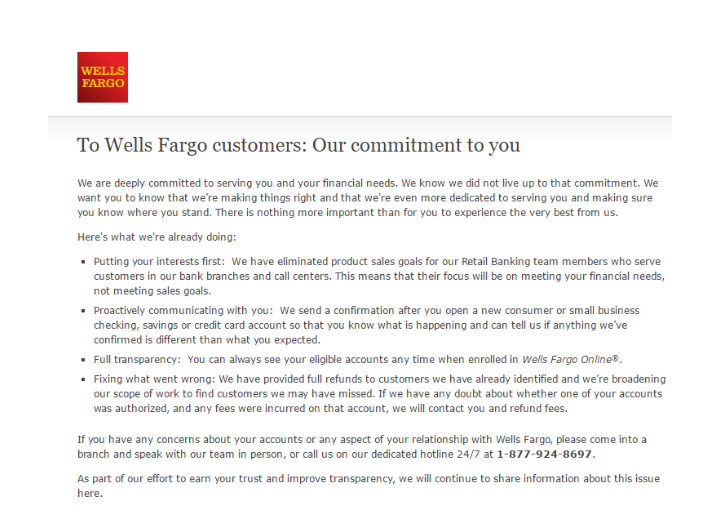 Regardless, Wells Fargo has a trust issue and that translates to a money issue. One analyst, Richard Bove of Rafferty Capital Markets, downgraded Wells Fargo shares to “sell” from “hold,” dropping his target price on the stock to $44 from $51. And this public scandal has created the expected mushroom cloud of anti-Wells activities. CNN Money reported, “Nathan Todd Davis said at a California State Assembly hearing on the Wells Fargo (WFC) fake account scandal that he filed 50 ethics complaints during his decade of working at Wells Fargo -- but nothing was ever done. "I've been harassed, intimidated, written up and denied bathroom breaks," said Davis, who drove 350 miles from his home in Lodi, California, to speak at the hearing. 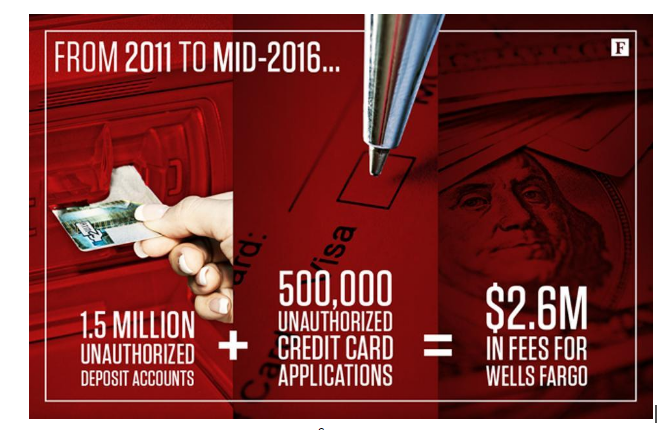 I cannot determine exactly when Wells posted the graphic below on its main page. I could also determine no evidence of a global conspiracy against Wells. YouTube: Wells Fargo Fake Accounts Scandal Who Should We Blame?